June 30 - New Zealand's men's and women's sides completed an historic double at the 2013 International Rugby Board (IRB) World Cup Sevens as both sides powered their way to victory at a rain-soaked Luzhniki Stadium in Moscow. New Zealand's men (pictured top) defeated England by a record final scoreline of 33-0, running in five tries in what was a very one-sided affair against the inaugural winners of the tournament in 1993. 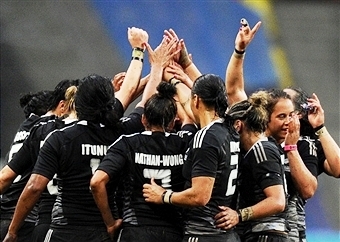 In the women's final, the All Blacks overcame Canada by 29-12, to become the second women's Rugby World Cup Sevens champions following Australia's victory in Dubai in 2009. Play had to be stopped for over an hour in Moscow as a huge thunderstorm erupted over the Luzhniki Stadium, which hosted the Olympics in 1980. Once play resumed conditions were not conducive to slick handling as heavy rain continued to fall throughout the day, saturating the pitch and making it difficult for players to keep their footing. It was the New Zealanders though, who coped with the unfavourable conditions the best. Up against defending champions Wales in the quarter-final, the All Blacks outscored their opponents by four tries to two in a 26-10 victory, before despatching Fiji in the semi-finals without conceding a point, despite the game being stopped for an hour midway through the first-half due to thunderstorms. The Fijians had overcome South Africa in a close affair by 12-10, thanks in the main to seven points from Metuisela Talebula, who finished the tournament with 43 points, second only to Canada's Nathan Hirayama with 49 points. There was not much between the sides in the other two quarter-finals. Eleven points from Christian Lewis-Pratt helped England defeat old rivals Australia, while two tries from Humphrey Kayange saw Kenya eliminate France, setting up a semi-final meeting with the English. 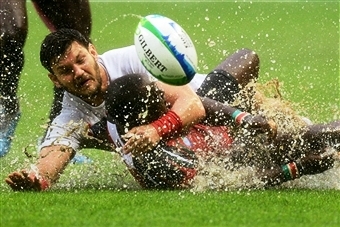 However, two tries from Dan Norton saw England defeat the African side by 12-5 and book a place in the final against current HSBC Sevens World Series champions New Zealand. This was the first time both countries faced each other in the final of the premier sevens tournament in the world. The dangerous Tim Mickkelson did not waste any time setting down a marker for the All Blacks, crossing the English line in only the second minute. That score set the tone for the rest of the game as New Zealand added two further tries before half-time to lead by 21-0. Waisale Naholo and Gillies Kaka added another two tries in the second period as the English had no answer to the power and running of the Southern Hemisphere side who ran out 33-0 winners in the end. 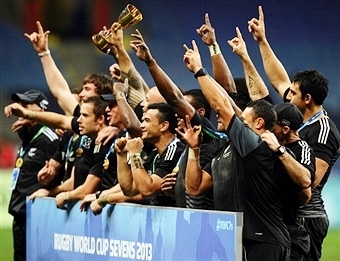 New Zealand now joins Fiji as two-time winners of the Rugby World Cup Sevens, following their first victory in Argentina in 2001. "It's been a long time between drinks," New Zealand coach Gordon Tietjens said. "It was an outstanding performance in these conditions. "They stuck to their game plan and played with heart out there." A disappointed England coach Ben Ryan paid tribute to his young side and said that they came up against a New Zealand outfit at the top of their game. "As a head coach of course I am disappointed with the final result but over the last three days I have been so proud of these lads," he said. "We have had a hard year and we have finished strongly." After finishing sixth in the HSBC World Series, England came into the tournament in Moscow in good form following their victory over Russia in the European Grand Prix Series in Lyon. "A lot of things went right this week in that we have won five games and we hit a World Cup Final for the first time in 20 years," said Ryan. "New Zealand are at the top of their game with some world class players at the best they'll ever be. "They have hit vintage and this will probably be their best year ever. "Our side is on the up, our lads are in their early 20s and I am sure they will be in more World Cup, Commonwealth and World Series finals." In the Plate final, Canada overcame Samoa 19-12, while hosts Russia delighted the home support by defeating Japan 29-5 in the Bowl final. However, there was disappointment for the Russian women's side in their quarter-final. Following their impressive win over a strong England side in the pool stages, Russia lost out to Canada in the knockout stages, going down 15-12. Canada then seen off Spain in the semi-final thanks to two tries from Ghislaine Landry. There was a possibility that they would meet their North American cousins in the final following the United States victory over Ireland in one of the other quarter-finals. That win set up a clash with New Zealand, who had defeated England 24-7 earlier, but the All Blacks ran out 19-10 winners over the US with two tries from Portia Woodman and one from Honey Hireme. Woodman, who finished the tournament as top try scorer with 12, and Hireme were both on the score sheet again in the final along with Kelly Brazier and Kayla McAlister as New Zealand ran in five tries to Canada's two on their way to a fine 29-12 victory, to add the Women's Rugby Sevens World Cup to their IRB Women's World Series title. All Blacks captain Huriana Manuel hailed the efforts of her teammates following their victory over Canada. "It feels amazing to be world champions," she said. "We have worked so hard for each other and we left it all out there on the field. I am so proud. "The weather conditions were hard but we expected to have to be able to cope with it. "We have something special in our team. "It is more than rugby - we play for each other and that is all that matters. "If we do that everything else flows. "We are sisters and we love playing for each other. "We expected a really hard game from Canada and that's what they gave us." In the women's Bowl competition, Fiji defeated the Netherlands 12-10 while 2009 Rugby World Cup Sevens champions Australia had to make do with winning the Plate competition following their 14-5 victory over England. Despite the festival of rugby on show in the Russian capital, concerns were raised about the lack of crowds that attended the three day event. 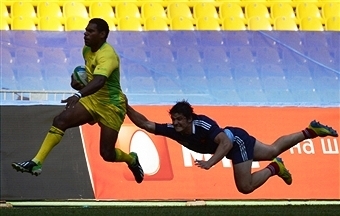 The IRB had hoped that the staging of the Rugby Sevens World Cup in Russia would open up the game to a wider audience ahead of its inclusion in the 2016 Rio Olympics. However, the Luzhniki Stadium, which has a capacity of 79,000, was just about a quarter full over the three days. The capacity had been reduced to 50,000 due to the use of advertising hoardings around the Stadium. IRB chief executive Brett Gosper said the rows of empty seats at the Luzhniki Stasium in Moscow during the Rugby World Cup Sevens was "disappointing"
Brett Gosper, chief executive of the IRB, put the low crowd numbers, estimated to be around 20,000 a day, down to the unpredictable weather conditions and some ticketing problems. "We came to Moscow to take the game to another part of the world, where the sport is developing strongly but still in its infancy, not in time, but a relative minnow," said the Australian. "We're probably a touch disappointed, we would have liked to have seen a few more people in the crowd, but we've been pushing 20,000 a day for this stadium. "We could have made a choice and put this in a smaller stadium and burst the seams of a 20,000-seater stadium, but in Russia doing in it in this stadium sends out an enormous signal to the Russians that this is a sport that is really top level. "It has an iconic value in that representation."